Be the first to share your favorite memory, photo or story of Joao. This memorial page is dedicated for family, friends and future generations to celebrate the life of their loved one. NEW BEDFORD-Joao M. Pires, 91, of New Bedford, died Tuesday, January 29, 2019 at St. Luke's Hospital. He was the widower of Maria E. (Mota) Pires and son of the late Manuel and Maria da Gloria (Cipriano) Pires. Born in Santa Cruz, Lagoa, Sao Miguel, Acores, he came to New Bedford with his family in 1968 and resided in Dartmouth with his daughter Guilhermina and her husband for the past 8 years. 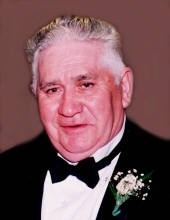 Mr. Pires was a parishioner of Our Lady Of Mount Carmel Church and was a member of the Holy Ghost Society. He was employed as a machine operator at Chamberlain Manufacturing, retiring when the business closed. He enjoyed playing dominoes and listening to sports on W.J.F.D. His family includes 1 son, John M. Pires of Burlington, NC; 6 daughters, Guilhermina Da Silva and her husband, Guilherme of Dartmouth, Gloria Borges-Santos and Maria Eduarda Sardinha and her husband, David, all of New Bedford; Lucy Duarte and her husband, Al and Maria R. Pacheco and her husband, Paul, all of Fairhaven and Natalie Pires and her companion, Mario Oliveira of New Bedford; 9 grandchildren, Andrea Borges, Erik Marques, Nicholas Marques, Forrest Pires, Blake Marques, Cassie Santos, Kaitlyn Duarte, Trevor Pacheco and Brayden Duarte; and several nieces and nephews. He was the brother of the late Jose and Jacinto Pires. His funeral will be conducted on Friday, February 1, 2019, 8:00 A.M. at the funeral home with a Mass of Christian burial to be celebrated in Our Lady Of Mount Carmel Church at 9:00 A.M. Visiting hours in the funeral home Thursday, January 31, 2019 from 5:00-8:00 P.M. Interment in Rural Cemetery. Funeral arrangements entrusted to AUBERTINE-LOPES FUNERAL HOME, 129 Allen St., New Bedford. For online guestbook and directions, please visit www.aubertine-lopes.com. To send flowers or a remembrance gift to the family of Joao M. Pires, please visit our Tribute Store. "Email Address" would like to share the life celebration of Joao M. Pires. Click on the "link" to go to share a favorite memory or leave a condolence message for the family.